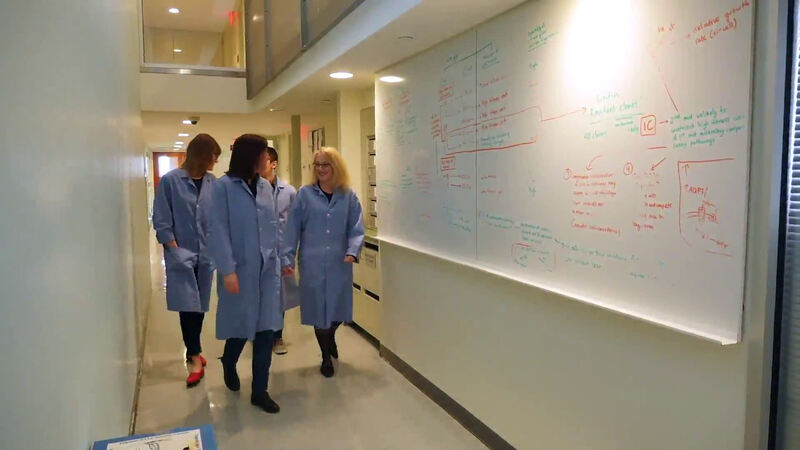 Columbia University researchers have developed a tool that is likely to revolutionize the way we detect and treat pathogens in everything from human health to agriculture to water. Using only common household baker's yeast, they've created an extremely low-cost, low-maintenance, on-site dipstick test they hope will aid in the surveillance and early detection of fungal pathogens responsible for major human disease, agricultural damage and food spoilage worldwide. The study appears in the June 28 issue of Science Advances. "Our biosensor allows us to detect a pathogen for less than one cent per test; it is easy to use, cheap to produce and doesn't require cold-storage facilities," said Principle Investigator and Columbia University Chemist Virginia Cornish. "It stands to impact agriculture and health, especially in developing countries, where it is arguably needed the most. We're excited about the possibilities." The project began as a search to find a cost-effective, simple way to detect cholera, but quickly evolved to address other needs. "We realized that the same household baker's yeast people use every day to brew beer and make bread could be programmed to detect a myriad of targets," Cornish said. "We can now alter the DNA of the baker's yeast to give it new functions that make it useful for a variety of applications. The prospect of using this technology in rural communities with little access to high-tech diagnostics is particularly compelling." Around the globe, fungal pathogens present an increasingly urgent public health burden, causing an estimated two million deaths annually and inflicting devastating losses on plant crops and population decline in animal wildlife. Still, fungal pathogens and the diseases they cause are often neglected and research to combat them is underfunded. 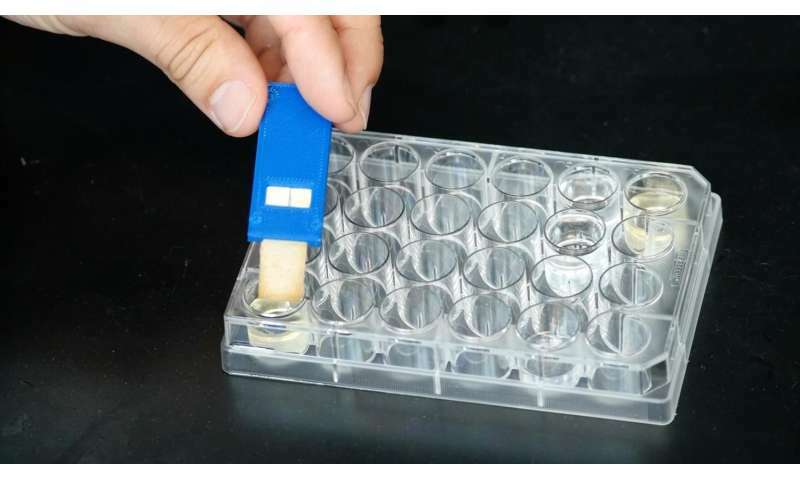 "Fungal pathogens are known as 'hidden killers,'" Cornish said, adding that the devastation is most pronounced in resource-poor areas where efforts to reduce infections have been hampered by the scarcity of cost-effective fungal diagnostics. While monitoring of global pathogen burden has been mostly limited to a small number of specialized centers, she explained, more effective surveillance could be established by making cheap diagnostics accessible at the point-of-care. Traditional diagnostics often rely on costly reagents, cold-chain distribution, specialized equipment and technical personnel, all of which are largely unattainable on-site. 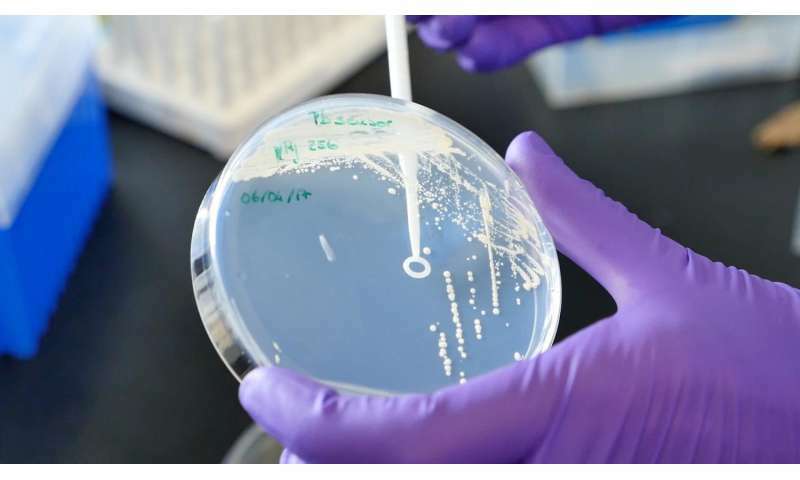 To address this problem, and in close collaboration with experts in public health, Cornish and a team of her students swapped out naturally-occurring cell surface receptors of Saccharomyces cerevisiae, or baker's yeast, with pathogen-specific receptor proteins. They started by building a biosensor for the detection of Candida albicans, a human fungal pathogen (a type of yeast) that occurs naturally in the human gut, but can cause serious medical problems and even death if the population gets out of control. After replacing bakers yeast's natural receptor with that of C. albicans, the researchers then altered its DNA to enable production of lycopene, the pigment responsible for the red coloring of tomatoes. This allowed the engineered yeast to turn red when in the presence of a target molecule, in this case, C. albicans fungus pheromones. The experiment was a breakthrough success. The sensor turned red when exposed to the fungal target. The team had developed a functional, simple, highly-specific, one-component sensor using only yeast. Next, the researchers successfully tested their assay for the ability to detect ten additional major pathogens, including Paracoccidioides brasiliensis, a fungus responsible for a progressive tropical disease affecting the mucosa in the nose, sinuses and skin, and Botrytis cinerea, a grey mold that causes substantial crop loss worldwide. In each case, the test functioned accurately without sacrificing any of the sensitivity and specificity attainable with other, significantly more expensive tests. With an operational assay in-hand, the team set out to make it versatile and user-friendly, designing a one-step rapid dipstick prototype, much like an at-home pregnancy test, that can be used in complex samples, including whole blood, serum, water, urine and soil. "New research in the area of synthetic biology has given us the ability to leverage live cells in the development of much more specific and helpful tools than we have had in the past," Cornish said. 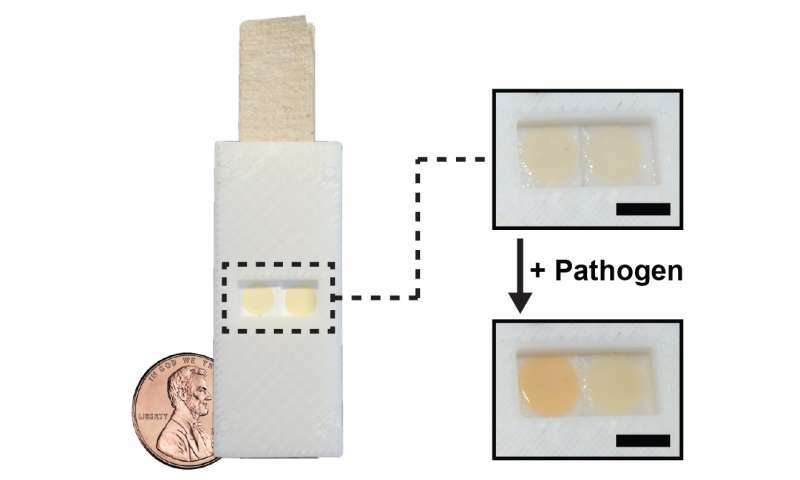 "Our assay can be cheaply made, economically produced at large-scale, widely distributed as a stable dried product for household use, robustly applied to complex samples, is not reliant on cold-chain storage, and can be readily detected by the eye without additional equipment, making it a compelling and completely feasible tool for surveillance of pathogens around the globe. This is critical for human health, food security, bioterrorism, and maintenance of biodiversity." The Columbia team is currently in conversations with global health non-profits and worldwide research, technology, development and citizen groups to determine the needs of specific countries. They believe there are many more applications for their sensor, including use in virus and bacteria detection, and a biosensor for cholera, a potentially-lethal diarrheal disease caused by the ingestion of food or water contaminated with the bacterium Vibrio cholera, is in the works to aid in African surveillance efforts. "The possibilities, as we see it right now, are limitless," Cornish said. "We've just opened the door to this exciting new technology. It's the beginning of a journey rich with potential." Cornish's student research team, all co-first authors on the paper, are Nili Ostrov, Miguel Jimenez and Sonja Billerbeck. Other co-authors are: James Brisbois and Joseph Matragrano, also of Columbia University; and Alastair Ager, of Columbia University's Mailman School of Public Health, and the Institute for Global Health and Development, Queen Margaret University, Edinburgh, UK. This is wonderful news for everyone!. I just hope that when the tests are completed that the test sample is completely destroyed to prevent it from becoming another out-of-control bio-hazard.